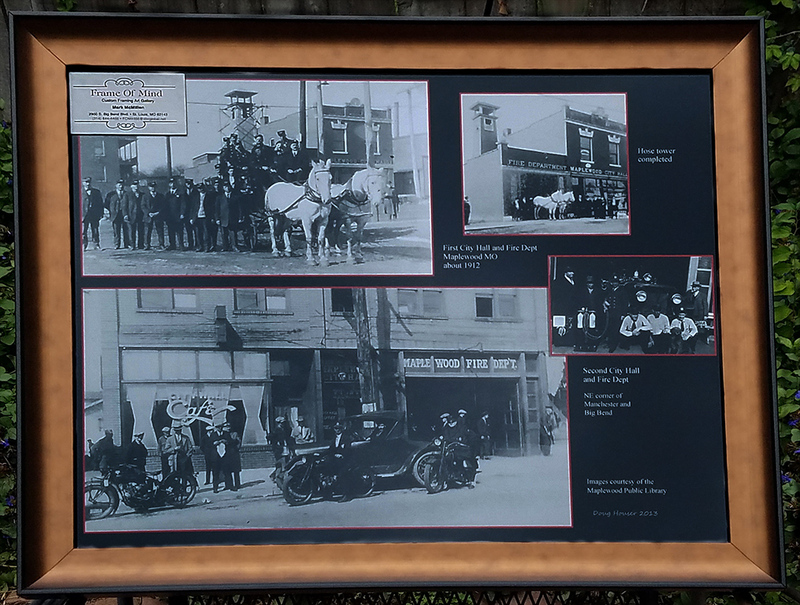 As has been my habit for the last, I don’t know, decade or so, I have printed a limited edition photograph of historic Maplewood images that will be available for purchase at the Mid County Chamber’s annual auction happening this Friday night (October 12) from 6 to 10. This one is a composite of photographs of our early firefighters and policemen. This is the same image that I submitted 5 years ago but I liked it and thought maybe someone else would like to have one too. And there is still only two of them. (Seems like I could use is or are in that last sentence. Isn’t that unusual? I don’t have any idea which is correct). The very talented fellows at the Frame of Mind have once again done a typical outstanding job with the framing of this exotic piece of arcana. They chose a copper colored frame which seems very appropriate to me since much of the hardware on those old pieces of fire equipment was made of copper and brass alloys including the very badges of the firefighters and policemen themselves. The word “cop” is derived from “copper”, a slang word meaning a policemen and referring to the badges. So don’t miss out on this opportunity to own a genuine piece of Maplewood History. And while you’re at it you can have a dinner with a lot of other fine folks from both Maplewood and Richmond Heights. Those guys at Frame of Mind do an absolutely first class professional job. I’d greatly appreciate it if you would bid this one up. Makes me look good. Thanks. This one is a tribute to some of Maplewood’s finest… our firefighters and policemen. 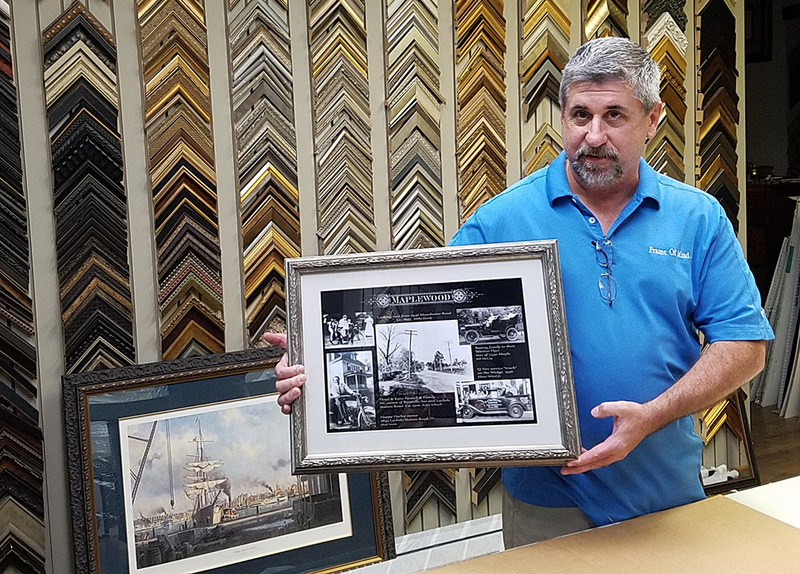 When you need framing done, this is the place to go… Frame of Mind Picture Framing Shop at 2900 S. Big Bend Blvd across from the Auto Zone. 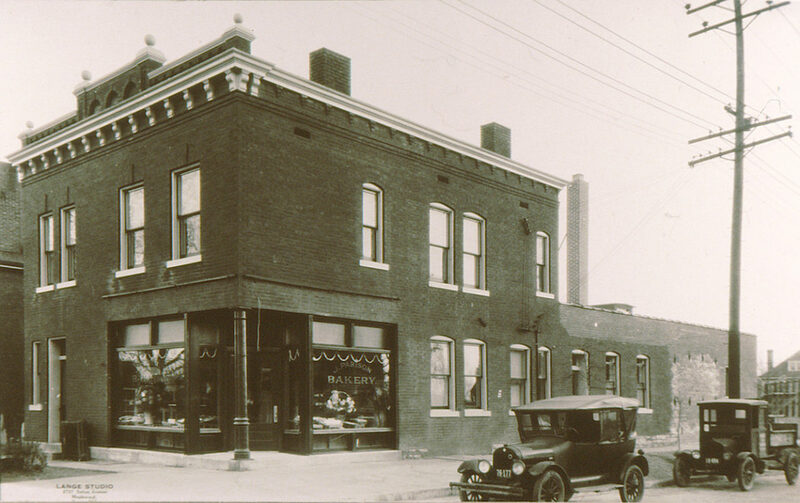 They are located in one of Maplewood’s finest historic buildings… the Parison Bakery Building. 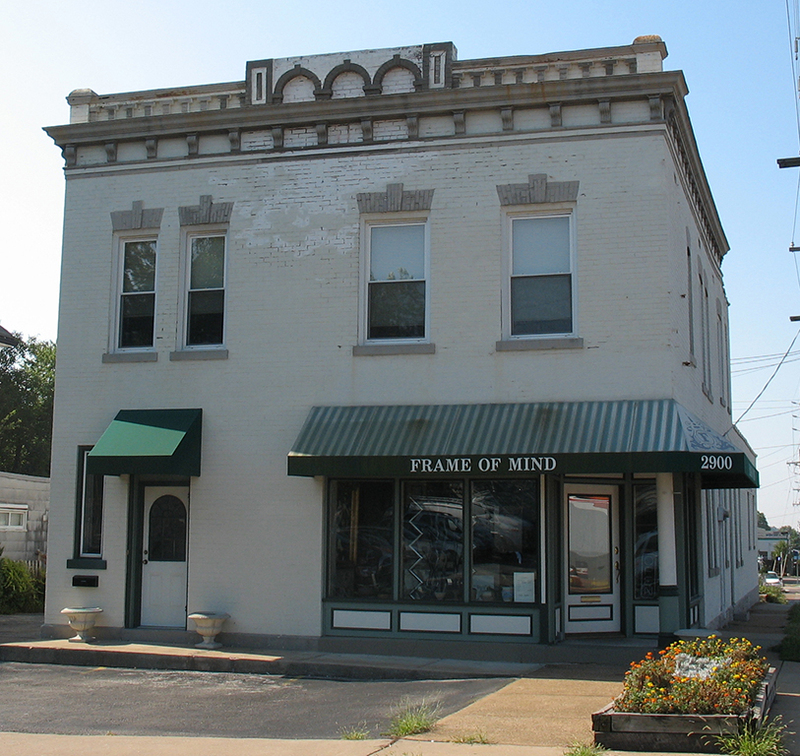 Keep your money in Maplewood and help support an historic building at the same time! That is Mark from Frame of Mind holding our offering to the auctionistas last year. Get your items framed where the pros do. Is that confusing? I think you have to attend the auction to bid on it. Anyone know if that’s right or not? Can you bid on this online? I thought I had heard that you could but a cursory search of the link included in the first sentence didn’t answer that question. We’ll get to the bottom of this. Thanks for pointing this out, Pickett. If you bid on it when you attend the dinner auction? Probably needs more info.